Welcome to No Books Allowed. This is a new monthly feature hosted by me, used to discuss things things in life which aren’t connected to books. This post can be used to talk about days out, music, TV, video games, films etc for all those book bloggers out there who do occasionally do stuff other than read and go to book events! The feature is usually posted on the last Thursday of the month unless that coincides with a blog tour/other book event. So you may have noticed a few changes around here. No where near as many as I have, trust me. October was a manic month for me and to be honest, so was September – so manic that there wasn’t even a No Books Allowed post last month! This is because things have seriously changed for me over the past couple of months. First of all work has gotten ridiculously busy and I have moved to the Manchester office. unfortunately this means early mornings, later finishes and by the time I get home I just want to climb into bed. I feel like all I do at the minute is work and sleep! I took some time to myself, and spent time with my lovely boyfriend and friends and family over the past few months instead of reading and its been nice but I do miss curling up on the couch with a good book. 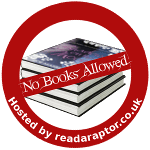 Because of this Readaraptor hasn’t been updated as much as it should have been and I took the downtime to rejig the site and move it over to wordpress. I hope you like it! I have been watching some awesome TV shows with the Mr too, like The Leftovers – which I keep recommending to anyone who will listen! – Our Zoo – which is a must watch if you haven’t already! – and the new series of The Walking Dead. I am loving the new Walking Dead episodes and they are making me want to get back into the graphic novels so expect them soon! As some of you may well have noticed (a lot of you actually, thanks for your tweets and instagram and Facebook comments!) there’s another reason why I have been so out of the loop with books the past couple of months, and why I wanted to keep quiet about everything non-booky! I found out right at the beginning of September that I’m having an ickle baba! I am so, so stupidly excited about it and I am looking forward to May 2015 soon much! I am already planning the nursery and there may have been some dinosaur purchases already been made, which won’t surprise you! I am very much a preperation is everything kinda girl when it comes to my life and I like to know everything in advance so I am very glad this was planned and I now have the next 6 and a half months to plan everything! I won’t be using Readaraptor to talk about Baby G very much as such. I want to blog about pregnancy and baby stuff but he or she will feature on a new subdomain I am in the process of sorting out. It will be linked to Readaraptor but the following system should be separate so if you aren’t interested then you should be ok just following this one! Anyway, now that I don’t want to just shout that from the rooftops with every non-bookish post there will be more talking about TV shows and games and other stuff each and every month, until you get bored of them! Thanks for stopping by!